Otolokpo was awash with joy on Saturday 8, December 2019 following the consolidation empowerment of sons, daughters, men and women of the kingdom by the Executive assistant to the Governor, Directorate of Orientation, Barr. Azuka, Eugene Uzum, popularly known as Uzumism. The Idigun of Otolokpo as he is fondly called, in his address, said the empowerment is geared at giving back to his people whom he said have stood with PDP over the years, and is also in line with his desire to see his people have a feel of the SMART agenda of the governor. He noted that he decided to give back to the people, saying that they have been loyal and supportive; hence it was time for them to have a feel of the presence of the government in the kingdom, and to also experience dividends of democracy within them. The empowerment which has been described as the first of its kind in the kingdom, saw each of the 7 students selected from different quarters go home with 50 thousand naira education grant, each of the five recipients went home with grinding machines given to men and women to enhance their already existent business, 3 beneficiaries of modern barbing equipment, 5 seamstress’ were empowerment with a set of modern sewing machines each, 4 hair dressers were empowered with a complete set of washing and setting equipment, 3 Vulcanizers went home with brand new vulcanizing machines, the farmers were not left out as 7 of them were given 30,000 naira financial grant to enhance production, 2 motorcycles were given out, of which one was given to the vigilante group, 50 women were given wrappers, 3 beneficiaries received a set of generator each, and there were also beneficiaries of deep freezer and catering equipment for caterers. 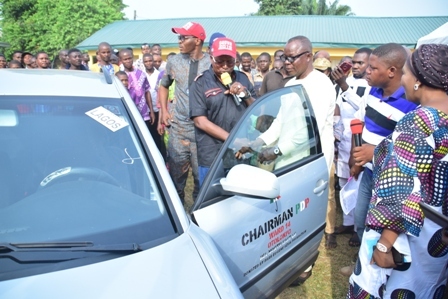 The mother of all were the buses and cars segment which saw three mini busses and 3 cars given out, with a mini bus given to St. Dominic Catholic Church, Otolopko, a car given to the ward 5 PDP Chairman, Mr. Nzemeke, and to the joy of all, a lucky female was given a car, all courtesy of Uzum Foundation. He stressed that Otolokpo is set, ahead of the general election to vote massively for Governor Okowa and all PDP candidates, saying that the community is focused and committed towards producing maximum result in consolidating on the SMART agenda of the governor beyond 2019. He disclosed that they are united, and ready to promote the five over five agenda of the PDP come 2019. The Orientation boss, while expressing appreciation to the community for their steadfastness in supporting PDP, described them as loving and loyal people. Noting that empowerment is a continuous process, he prayed for the ability to do more in no distant time. He further appreciated the governor for finding him worthy to serve in his government, stressing that he will remain resolute in his service to his people and the State government at large. In his address, the Chairman, Peoples Democratic Party, (PDP), Ika North East, Chief Godwin Ogadi on behalf of the party, applauded Barr. Uzum for empowering his people, disclosing that more empowerment will be coming to the kingdom soon. Responding to HRM. Alioma Collins, Obi of Otolokpo who had earlier expressed concerns over the deplorable state of roads in the Kingdom, he stated that that plans are in motion to provide better road networks in the kingdom. He promised to relay their concerns to Governor Ifeanyi Okowa, expressing optimism that their concerns will be addressed in the shortest possible time. He enjoined the people to give governor Okowa maximum support, noting that Ika nation will complete her 2 tenures as governor. He canvassed support for Barr. Victor Nwokolo for a third term, explaining that more developments will come to Ika land when the governor and his team are returned in 2019. He further explained that when there is a synergy between a Governor and all other elected officers in the State, chances of developmental strides are enhanced, declaring that the reverse is the case when a Governor and other officers are not of the same party system or do not work harmoniously. He averred that for Ika nation to experience maximum development beyond 2019, Hon. Victor Nwokolo should be re-elected to work harmoniously with the Governor. He therefore appealed to the people to vote PDP all the way, to consolidate on the good works of the governor in 2019. Praying for the victory of PDP and her candidates, HRM, prayed that the governor and all his team will be declared winners come 2019, to ensure they work in synergy for the betterment of all. The event was well attended by party faithful all over the State.